But not your everyday, live-on-the-savannah giraffe. Mitford lives in the city. But not your everyday, filled-with-people city. This city is filled with animals. especially the animals who work at COVER magazine. Mitford would do ANYTHING to work there. But first Mitford must prove himself. 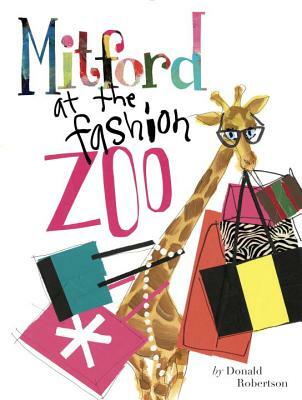 Can Mitford survive the Fashion Zoo?! Donald Robertson is a Toronto-born/New-York & LA- based artist whose prolific career spans decades and industries. Robertson has dedicated his whole career to the creative industry, most recently rejoining Estée Lauder on special projects where he works today. To his credits, Donald worked with the founders of MAC Cosmetics, where he helped launch VivaGlam to raise millions globally for the fight against AIDS. Next trading in beauty for fashion, Robertson launched American Marie Claire before redesigning American Glamour with Conde Nast and Hearst. In the past two years, he has focused free time on his solo art career after Instagram launched him into the global spotlight where the press has named him the "Andy Warhol of Instagram." His interview by Lee Woodruff aired on CBS This Morning, adding to countless features in publications including CR Fashionbook, Vanity Fair UK, Vogue Korea, Vogue Brazil, Harper's Bazaar, the NY Post, and InStyle Magazine. Among his many projects, recent highlights include an art show at Colette in Paris, collaborations with prolific fashion designers including Giles Deacon, Jenna Lyons of J Crew, and shoe designer Brian Atwood, his first solo gallery show at Eric Firestone Gallery in East Hampton, and the birth of his two twin boys, Charlie and Henry. This summer, Donald took over the windows of Bergdorf Goodman as he prepares for his first book release, Mitford and the Fashion Zoo. Follow him on Instagram @drawbertson.